**** Chosen by Winner: Jamie S.
The M.U.D.D. (Multi-Utility-Dirt-Defiant) folder features a sealed locking mechanism to prevent failure due to dirt and debris. This design was always intended to be an automatic, it's just taken a few years to come to fruition. 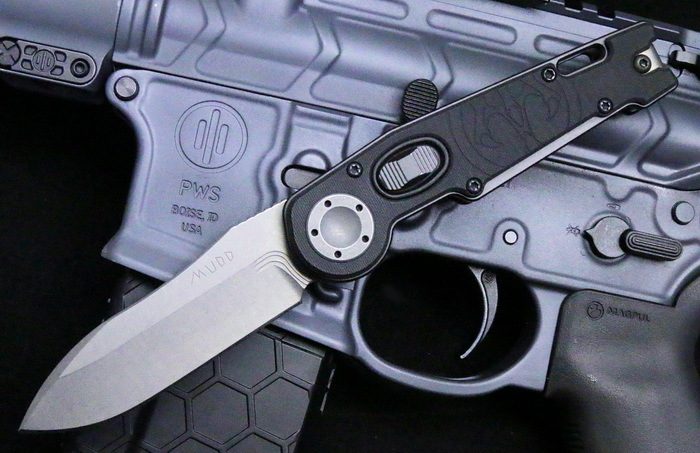 While the manual M.U.D.D knife is a mile stone unto itself, having a completely sealed automatic M.U.D.D knife is a game changer! The idea of having a completely sealed auto is important because of all the small, intricate parts. If you drop an automatic in the dirt, it's not only difficult to take apart and clean, but it's going to be difficult to put back together. Having an automatic that you never have to take apart was our goal, and we are excited to announce the design! To give a brief history, we are a father and son team, Grant and Gavin. We have been making knives since 1995 in Idaho City, Idaho, an old gold mining camp of the mid 1800’s. We started off making fixed blade knives for a small local market of hunters and horsemen. When we began doing knife shows we became interested in the different innovative styles being developed in the knife industry and decided to focus more on how we could contribute. From that point forward, we have been developing a series of designs for both folders and fixed blades that reflects our best efforts at contributing to the body of innovative knife designs.